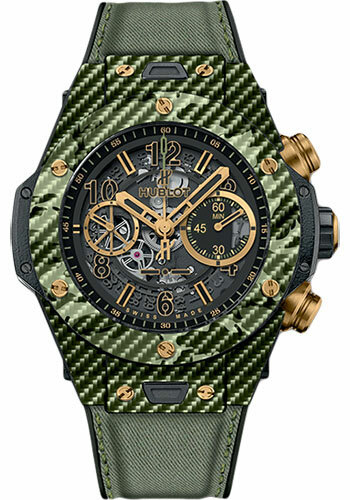 45 mm carbon fiber case with green texalium upper layer, carbon fiber and green camo pattern texalium bezel with upper layer with 6 h-shaped 18K yellow gold screws, sapphire crystal with anti-reflective treatment, mat black and yellow gold color skeleton dial, HUB 1242 self-winding movement with flyback chronograph and column wheel, approximately 72 hours of power reserve. Water resistant to 100 m.
45 mm blue carbon fibre case with texalium, carbon fiber and light blue camo pattern texalium bezel, matte black and blue lacquered skeleton dial, HUB 1242 self-winding movement with flyback chronograph and column wheel, approximately 72 hours of power reserve. Water resistant to 100 m.
45 mm carbon fiber case with black texalium upper layer, carbon fiber and black camo pattern texalium bezel with upper layer with 6 h-shaped 18K King Gold screws, sapphire crystal with anti-reflective treatment, mat black and King Gold color skeleton dial, HUB 1242 self-winding movement with flyback chronograph and column wheel, approximately 72 hours of power reserve, black rubber and genuine black chino strap, carbon fiber and black-plated titanium deployant buckle. Water resistant to 100 m.